The National Audit Office has just reported on yet another hidden PFI cost. It seems the public sector has been getting ripped off over changes to PFI service contracts. The problem arises because, although public sector requirements are specified at the outset of a PFI contract, over the course of 25 to 30 years of operation changes will inevitably be needed to the services and assets provided. And as anyone who has ever had building work done will know, once you vary from the originally agreed spec, you can find yourself looking at some serious additional cost. In the case of PFI, that unplanned additional cost is already running at £180m pa (2006). and that's on top of the £5bn pa being paid out in base PFI charges. 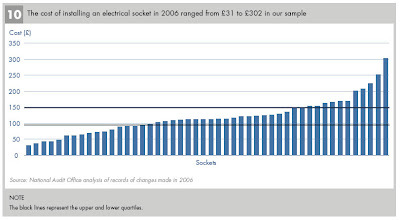 "Changes to operational PFI deals are often poor value for money"
Small changes are often expensive and late- as the chart above shows, the cost of installing an additional electrical plug socket, a very common requirement, varies from £30 to £302, an extraordinary tenfold variation; again, the labour cost only for fitting a whiteboard ranges from free to an extortionary £150. Changes attract £6m pa unjustified fees- "most private sector PFI partners charged additional management fees, typically 5-10 per cent, on top of those made by service providers to cover their overheads and profit, which were very often not justified in terms of the work needed to process small changes., It is estimated that, in 2006, these fees cost the public sector £6 million"
The Report also highlights a point very familiar to BOM readers- the staff handling these negotiations for many public sector PFI customers are simply not up to the job. They report "poor control of change requests, inadequate job briefs, no checks or challenges over costs and disputes over relatively insignificant matters." As we've said many times, having the public sector intermediate itself between us and those sharp private sector operators is a recipe for rip off.